Nashville-Based Gray Line Trolley sitting at the Bowling Green Historic RailPark and Train Museum before passengers board. The first few days of trolley rides are a trial period to see whether residents are interested in the service. Gray Line is a private business and is sponsoring the free rides. If the service becomes permanent, those wanting rides would pay. That cost hasn’t been determined yet. Beth Noffsinger is the public relations manager with the Bowling Green Convention and Visitors Bureau. She said free rides are available from 2 to 8 p.m. Friday, and 9 a.m. to 2 p.m. Saturday. “There’s a tour guide so you’ll get to learn about the history of Bowling Green as you make the loop. It starts and ends at the rail park and should take about half an hour,” she said. Noffsinger said Gray Line will offer customers two different tour line options if they decide to make the trolley service permanent in the spring. 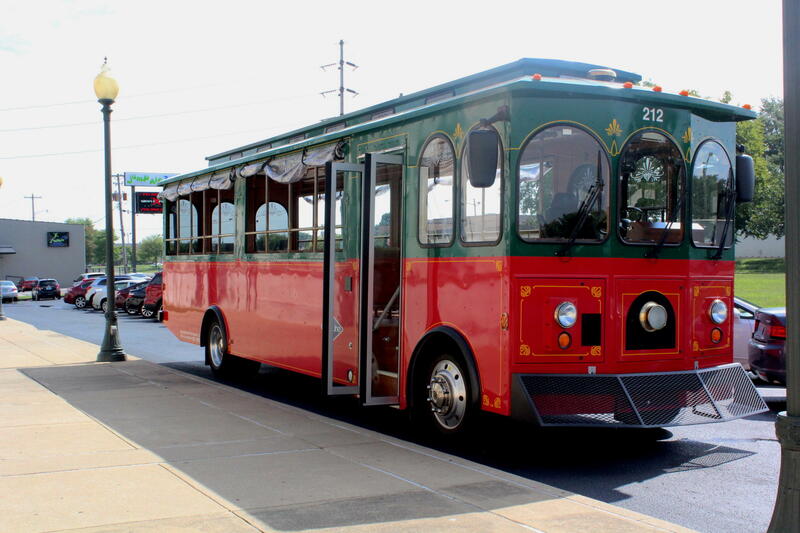 Trolley rides are also being offered Saturday for those attending WKU’s home football opener. The rides will start at 4 p.m. at the downtown parking garage on College Street and run to Preston Center on WKU’s campus. Return trips will begin in the fourth quarter.